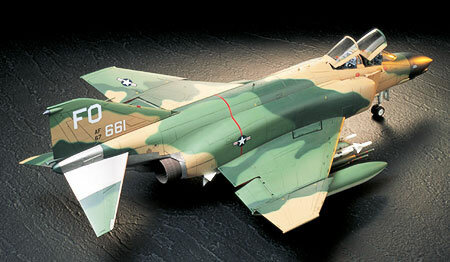 << Back TAMIYA "McDonnell F-4C/D Phantom II"
TAMIYA "McDonnell F-4C/D Phantom II"
By 1982 the F4 had fought in 5 major conflicts, nine years in Southeast Asia, twice in the desert of the Middle East and against each other at one time. It was used in every role; Fighter interceptor, Fighterbomber, Reconnaissance, Tanker and Drone. They specialized in attack roles as Wild Weasel defense suppression and laser designator bombers. They also defeated the best aircraft that the opposition could put against it. The only time it lost was when pitted against another F4, during the Greek-Turkey conflict. With the U.S. Navy in the headlines everyday with this new interceptor, the American Defense Department ordered competitive tests be flown against the best aircraft in the U.S. Air Force inventory. Convair's F-106 Delta Dart was selected to fly against the Navy's Phantom II, and the Phantom easily won top speed, low-level speed, altitude, plus the unrefueled range and radar range. Following this flyoff, much to the disgust and embarrassment of the Air Force, it was decided that the next Air Force fighter would be this U.S. Navy design. It would at first supplement, then totally replace the Air Force F100; F102; F104 and F105 strike and interceptor aircraft. Under the designation F110A, the Air Force Phantom II was basically a Navy-4B airframe with changes made to meet Air Force requirements. Following the F-4C, which was essentially the same aircraft as the designated F110A, the F-4D version was more closely tailored to meet the requirements of the Air Force. With these two versions, the Phantom II established its unparalleled esteem in the U.S. Air Force. The F-4's in the U.S. Navy had numerous variants through its career to fulfill various requirements from the Navy as well. Following the F-4G, which was developed as a trial, the next variant was designated the F-4J to avoid confusion with the original F4H-1 The F-4J was designed as the follow-on to the original F-4B, correcting some of the deficiencies which had become apparent in service. Its maiden flight was made on 27th May 1966, and mass production started shortly after. As the F-4J was developed for the U.S. Navy in parallel with the F-4D of the Air Force, they had a few differences. The new J79-GE-10 powerplant was further improved from the previous J79-GE-8 to yield more power. Internally, upgraded radar, with an improved fire-control system and a new missile-control system, were fitted to earn even better interception and ground attack abilities. In addition, a fixed inboard leading edge along with a slotted tailplane contributed to better maneuverability at low speeds. Lift at low speeds was further enhanced by furnishing 16.5o dropped ailerons. As a consequence of these alternations, its approach speed was reduced by 20km/h. A further noticeable difference from the previous variants was the bulged inner wingfoot to accommodate the larger wheels employed to cope with its increased weight. Armament was also bolstered. AIM-7 Sparrows and AIM-9 Sidewinders were equipped as the main weapons for air-to-air combat, and a wide variety of bombs, missiles, rockets and explosives could be fitted according to the mission. The maximum load of armament was 5 tons which made the F-4J's attack capability outstanding. Further changes were introduced during the course of production, such as a provision of Sidewinder Expanded Acquisition Mode (SEAM) and addition of various dogfight-capable computers. It was in March 1967 when the F-4J's delivery to the corps started. U.S. forces were in midst of the hard-fought conflict against North Vietnam. Back in 1961, the U.S. government decided to send their troops to Vietnam to support the South Vietnamese government, and the conflict kept spreading day by day. Under these circumstances, the Phantom II played a main role in the sky. The Navy's Phantom II's were flown from aircraft carriers, and the Phantom II's of the Air Force and the Marines were flown from their bases in South Vietnam and Thailand to engage in North Vietnameses's MiGs. It was the end of May 1968 when the F-4J's carried on the aircraft carrier "America" first appeared over the Vietnamese sky. On 21st July, an F-4J shot down a MiG 21, which was recorded as the first kill by the F-4J. F-4J's streamed to the battle field, and achieved outstanding military results against MiG's especially after resumption of the North Vietnam bombing. The only "Ace" status in the U.S. Navy during this conflict was attained by an F-4J on 10th May 1972. Lt. Randy Cunningham and Lt. William Driscoll, who had already shot down a MiG 1 and MiG 17, gained three MiG 17's on the day, making themselves the first aces. However, their "longest day" was not concluded. Soon after their fifth kill, on their way back, their F-4J was tagged by a missile from the ground and the pair ejected and were rescued at sea. The mass production of the F-4J ceased in December 1972, recording 522 aircraft as the total number produced. The F-4J proved its superb combat capability mainly in the Vietnam conflict throughout its career, and contributed to establishing the high reputation for the Phantom II series all around the world. Seven F-4J's were slightly modified for use by the U.S. Navy's "Blue Angels" flight demonstration team as well. These aircraft had oil and smoke injectors added, and were beautifully painted in the team's attractive blue and gold colors. Their acrobat demonstrations fully utilized their full potential at the many air shows held for the public. Although being replaced gradually by the F-14 Tomcat in the Navy and the F-15 Eagle in the Air force in recent years, the Phantom II dominated the sky all over the world as a guardian for western alignment till the 80's.